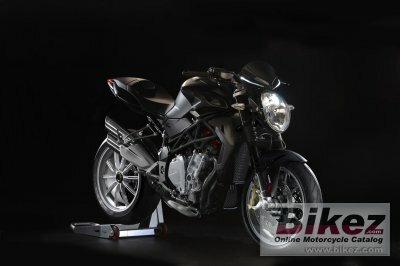 2018 MV Agusta Brutale 1090. Picture credits - MV Agusta. Submit more pictures. When you say Brutale, you think MV Agusta. The Brutale has already made motorcycling history. The child of ingenious intuition, way back in 2001, it redefined the concept of naked bikes. Frame type: CrMo Steel tubular trellis ALS. Aluminium alloy swin arm. Front suspension: MaMarzocchi �UPSIDE - DOWN� telescopic hydraulic fork with reboundcompression damping and spring preload external and separated adjustment. Front brakes: Double disc. Optional ABS. Floating disc. Brembo radial-type, monobloc with 4 pistons. Electrical: 12V 8.6Ah battery. Alternator 350 W at 5000 r.p.m. Comments: Thermoplastic fairing. Adjustable 8-level traction control. Ask questions Join the 18 MV Agusta Brutale 1090 discussion group or the general MV Agusta discussion group. Bikez has discussion forums for every bike. View comments, questions and answers at the 2018 MV Agusta Brutale 1090 discussion group. You can sign up for e-mail notifications when other riders answer you. If you have extensive experience with the MC, please send us a review. If you consider buying this bike, you should view the list of related motorbikes Look at photos. Compare technical specs. And check out the rating of the bike's engine performance, reliability, repair costs, etc. You can compare the rating with other bikes.